In 1922, Albert Einstein traveled to Paris to deliver a talk on his newly formulated Theory of Relativity to an anxious group of listeners at the College de France. In his previous appearances in the US, England and Italy, Einstein chose to speak in German and Italian, respectively. When he arrived in France, according to physicist and astronomer Charles Nordmann, he was nervous about his lack of fluidity in French, and so decided to do a short dissertation and then open to questions and conversation. This would allow him to navigate through the language more thoughtfully and accurately. “The theory of Einstein is a marvelous tree that has grown farther and higher than any other ideal flowers of human thought,” Nordmann concludes. Einstein’s Paris mission was not just to inform the French of his new and revolutionary scientific ideas. On June 28, 1919, Germany and the Allied Nations (including Britain, France, Italy and Russia) signed the Treaty of Versailles, formally ending World War I. Oddly, Einstein biographies often herald his trip to Paris as one the most important events of the era—not because of the science, but because it was a peace mission meant to begin to mend ties between Germany and France, and reestablish international intellectual relations that had been cut off during the war. Einstein’s presentation was attended mostly by scientists, researchers and philosophers. There is no documentation of his speeches from his presentation, however, Nordmann took notes on the event and published them as Einstein and the Universe later in 1922. In considering whether I am really talking to Einstein when I channel, I pose the same questions that Einstein himself might have asked of us: Is imagination more important than knowledge? Are you willing to conduct your own “thought experiments” like he did and consider the information that is coming through me? Regardless if I can “prove” that I’m talking with Einstein, the body of work that has arisen out of my willingness to believe I am—the unified field theory and maps of human consciousness, along with the process to bring unity to the human psyche—are not only worthy of being considered an Einsteinian design, but reflect many of the values and concerns that Einstein had when he was alive. It is my hope that Conflict REVOLUTION can create an awareness and dialogue around both science and peace, and inspire all of us to look at our lives in revolutionary new ways. Let my channeled Einstein spark your own imagination to ponder these issues. Allow him to inspire you to find new solutions to old problems by looking deeply into your own life and expand your awareness to include the infinite possibilities that exist that you may not be able to see just yet. Join me in Copenhagen as I train Conflict REVOLUTION and channel Einstein. December 13, 2014. More information here. 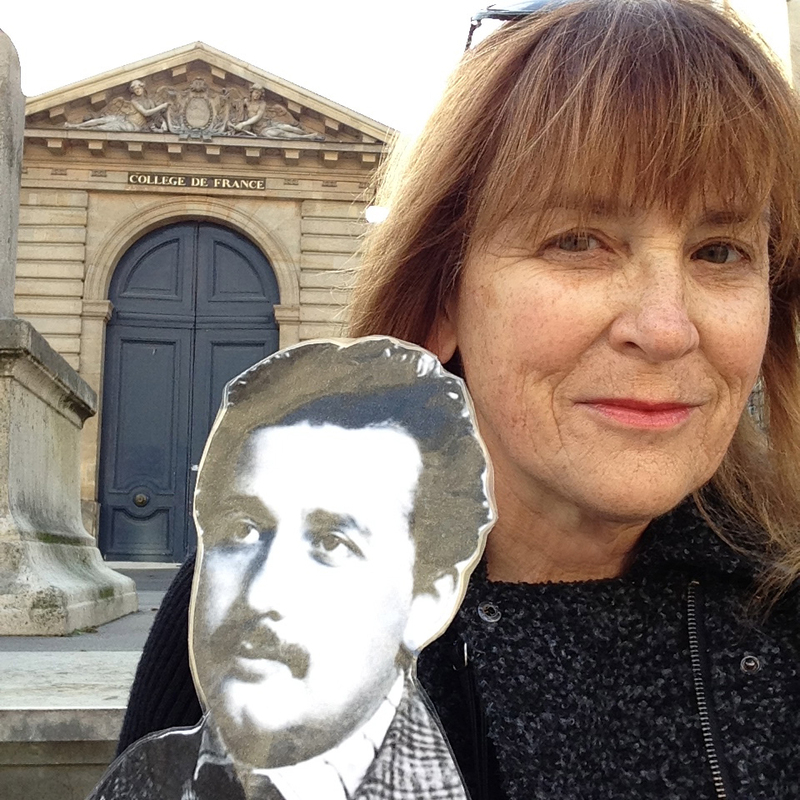 Einstein and me, back at the College de France in Paris, November 2014.